Four years later, Razer redefined the limits of gaming performance by creating mechanical switches that were designed specifically to meet the demands of gaming - the Razer™ Mechanical Switch was born. The classic. For those who want to feel and hear every keypress, the Razer™ Green Mechanical Switch features a tactile bump and distinctive click sound along with optimized actuation and reset points for best in class gaming and typing performance. Silent, but deadly. 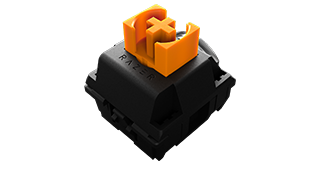 The Razer™ Orange Mechanical Switch are for those who enjoy a tactile bump and feedback without the audible click. 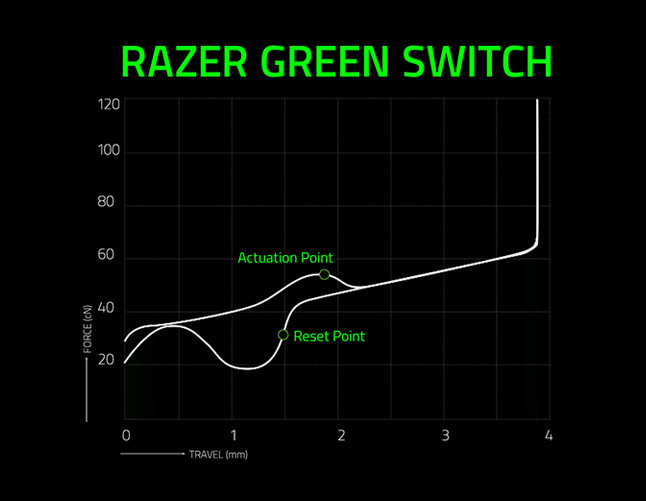 Enjoy the same optimized performance with less actuation force as a Razer™ Green Mechanical Switch, while maintaining a quiet gaming experience. The fastest and quietest switch. 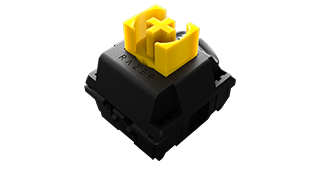 Best for rapid-fire keypresses and fast-paced gaming, the Razer™ Yellow Mechanical Switch has an ultra-fast actuation of only 1.2mm, which allows you to press keys multiple times as fast as possible. 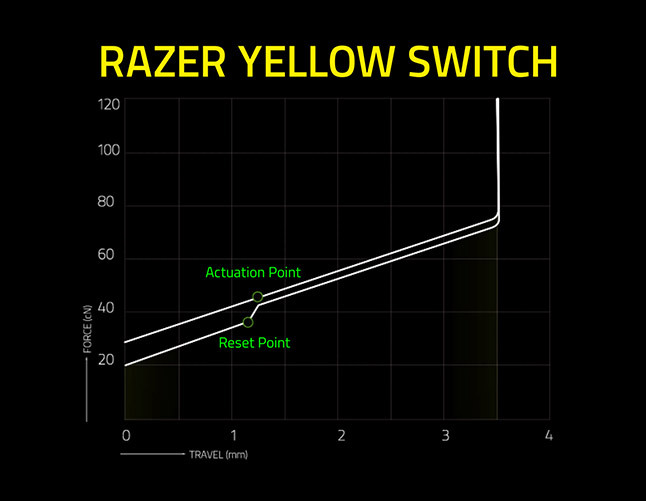 Razer controls the entire manufacturing process of each switch, even the blueprint. 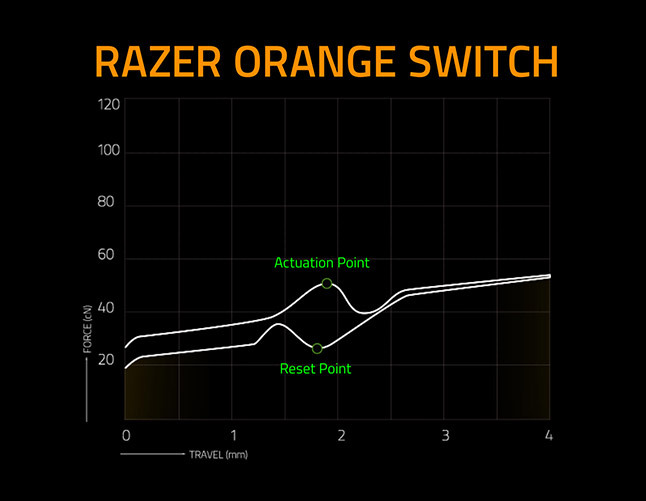 Through this, Razer Switches are designed from the ground up and optimized to cater for the demands of competitive play. This enables tighter tolerance and quality assurance protocols, to make sure that every switch lasts. Featuring an 80 million keystroke lifespan – designed to last 60% longer than other leading switches – Razer™ Mechanical Switches give gamers the assurance they need in the most intense situations. Mechanical Keyboards The use of mechanical keyboards started around the 1970s. 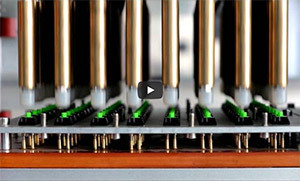 Back then, keyboards were big, bulky, and expensive to manufacture. PCs appearing in every home drove a demand for cheaper keyboards—which typically used membrane switches. However, mechanical keyboards were still favored for durability and performance. Keyboards Become Mainstream PCs appearing in every home drove a demand for cheaper keyboards—which typically used membrane switches. However, mechanical keyboards were still favored for durability and performance. - The Razer BlackWidow In 2010, Razer created the Razer BlackWidow. Equipped with tactile keys, it was the only keyboard then to meet the needs of gamers. 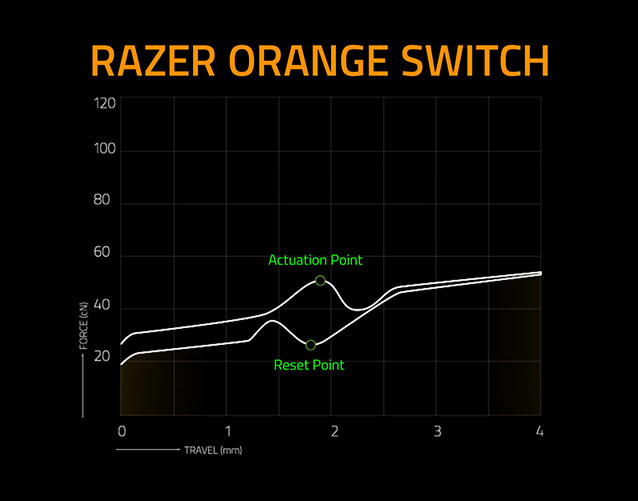 - Designed for Gaming Razer started producing proprietary switches in-house. By controlling the entire design and manufacturing process, every switch made was of the highest quality and durability. Razer™ Mechanical Switches - Designed for Gaming Razer started producing proprietary switches in-house. By controlling the entire design and manufacturing process, every switch made was of the highest quality and durability. Mechanical Switch The exploration of mechanical switches on mobile devices birthed Razer's own ultra-low-profile mechanical switches—with true actuation and reset points. They were introduced with the Razer Mechanical Keyboard Case, and subsequently, the Razer Blade Pro. Mecha-Membrane By combining the soft, cushioned touch of a membrane switch with the crisp, tactile click of a mechanical keyboard—Razer™ Mecha-Membrane technology made its debut with the Razer Ornata. 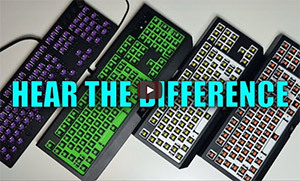 The Introduction of Razer™ Mecha-Membrane By combining the soft, cushioned touch of a membrane switch with the crisp, tactile click of a mechanical keyboard—Razer™ Mecha-Membrane technology made its debut with the Razer Ornata. 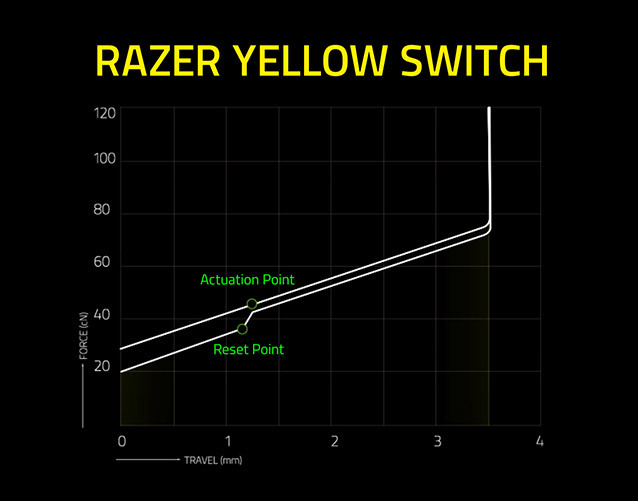 – Razer™ Yellow Switches The launch of the Razer BlackWidow Chroma V2 featured the new Razer™ Yellow Switch. Its linear and silent design with reduced travel distance allowed rapid-fire keypresses, giving gamers everywhere the competitive advantage. with Dual Side Walls Alongside the new Razer BlackWidow Elite comes with a switch upgrade - the new Razer™ Mechanical Switch now comes with dual side walls for increased stability and consistency. The Razer™ Mechanical Switch has evolved—dual side walls for greater stability, in addition to increased protection against dust and liquids. With an industry-leading 80 million keystroke lifespan, the Razer BlackWidow Elite is built for reliability and extended peak gaming performance. 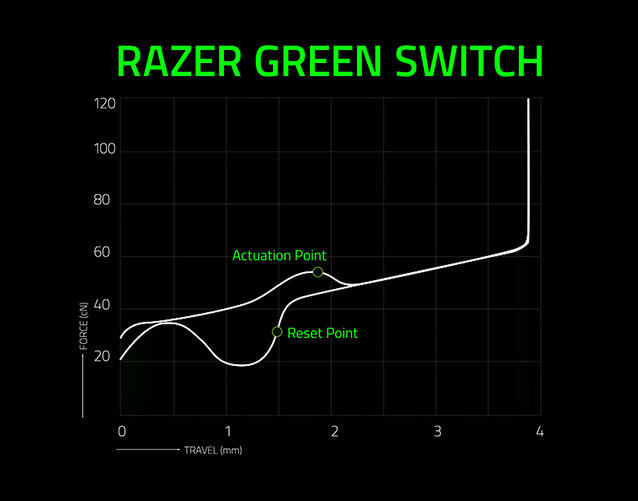 Why did we make the Razer™ Mechanical Switch? 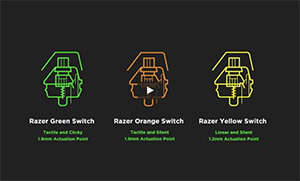 What does it take to make a Razer™ Mechanical Switch? The Razer BlackWidow has been consistently redefining gaming excellence, securing its position as the best-selling gaming keyboard in the world and the clear choice of pro gamers everywhere. Available in an impressive range of variations, you can choose the specific combination of design, features, and switches to suit your exact needs.